At some point, I wanted to do a series highlighting the really awesome Goose scenes that one of my neighbors does. So I posted this one last Thanksgiving. 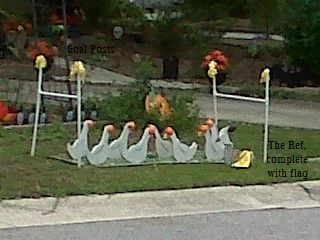 But much to my dismay, she stopped decorating her geese for a while. I know, I know, you were disappointed as well. BUT yesterday on my way to take the kids to school, I saw the geese playing football. It’s a really bad picture taken with my cellphone while I was walking with the kids (pushing 60 lbs of kid + 20 lbs of stroller for 45 minutes is no easy task)….but the geese have little helmets (! ), and the official has a yellow flag (!) and striped shirt (! ), and there are goal posts (! )…and she has them all on a blanket with a football field printed on it. I just love that this is the first thing you see when you come into our neighborhood. Hooray for football season and USC’s first home game….and the return of the geese.